Despite being on a hop-on hop-off bus tour today, I managed to take absolutely zero tourist photos! What is wrong with me? I blame it on hat euphoria. 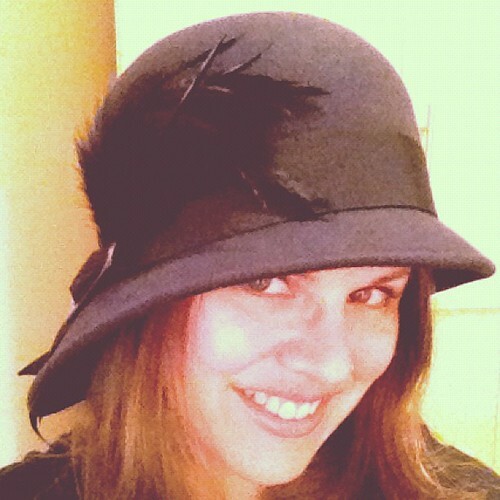 Although this is a terrible, last-minute, low-quality photo of it, I am wearing the best hat I have ever owned. It is dark purple wool with a black band and feather. FunkyPlaid and I first spotted it last week in Fabhatrix. In a conversation with my father and stepmother about shops we love, it came up again. Today we strolled past Fabhatrix on our way to brunch, and my father bought it for me as a souvenir. I felt like a movie-star on the hop-on hop-off bus tour. I don’t imagine movie-stars go on those, but I felt like one anyway.